Astronomers using radio telescopes in New Mexico and California have discovered a giant, rotating disk of material around a young, massive star, indicating that very massive stars as well as those closer to the size of the Sun may be circled by disks from which planets are thought to form. This is the most massive young star for which such a disk has yet been found. Debra Shepherd of the California Institute of Technology (Caltech) and Stan Kurtz of the National Autonomous University of Mexico, used the National Science Foundation's Very Large Array (VLA) radio telescope and telescopes of Caltech's Owens Valley Radio Observatory (OVRO) to make a detailed study of an object called G192.16-3.82, in the constellation Orion. They announced their findings at the American Astronomical Society's meeting in Austin, TX, today. What astronomers call Young Stellar Objects (YSOs) -- stars still in the process of formation -- are enigmatic objects, both drawing in material from their surroundings and expelling material outward at the same time. "The details of the interaction between these two processes are poorly understood," Shepherd said. "In addition, most theories are based on observing low-mass stars, and we don't know if things work the same way with higher-mass stars." "We now have the first unambiguous evidence for a rotating disk around a high-mass star that also is powering an outflow," Shepherd said. "We need to make more observations to confirm the finding, but this information will help test theories of how such young stellar objects operate." It has been difficult to study massive star formation, because massive stars are rarer than smaller ones, they tend to form in clusters, making observations more difficult, and there are few of them forming relatively nearby. The object that Shepherd and Kurtz chose is reasonably isolated. "We think it provides us with a good laboratory for studying the process," Kurtz said. The young star at the core of G192.16-3.82 is about six to 10 times more massive than the sun. The rotating disk and an "envelope" of material surrounding the star contain about 20 times the mass of the sun. 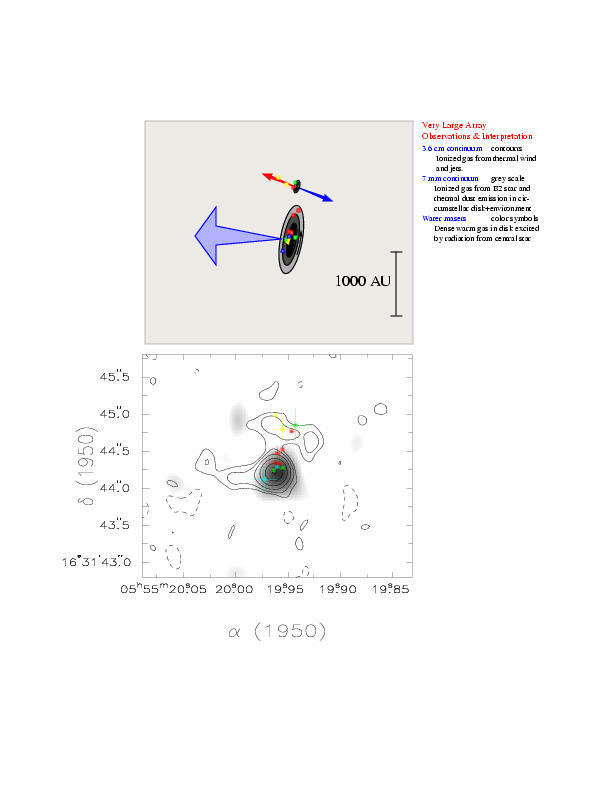 VLA observations revealed the speed of material in the disk, indicating that the disk is rotating around the central star according to Kepler's laws of planetary motion, just as the planets of our Solar System do. The disk extends outward from the star more than 500 times the Earth-Sun distance. "This is comparable in size to the largest disks seen around smaller stars, but this one is at least four times more massive than those disks," Shepherd said. During star formation, the material in such disks is thought to be drawn into the new star by its gravitational pull, while other processes power an outflow of material into the surrounding space. The outflow in the region of G192.16-3.82 is one of the largest such outflows in our Milky Way Galaxy. The velocity measurements were possible because the disk contains water molecules that amplify microwave radio emissions in a manner similar to that in which a laser amplifies light. The water molecules that act as amplifiers -- masers -- both appear as bright spots on radio telescope images and are emitted at a specific, known radio frequency. The molecules' motion causes that frequency to be changed by the Doppler effect. The amount of change allows scientists to calculate the velocity. The VLA is an instrument of the National Radio Astronomy Observatory, a facility of the National Science Foundation, operated under cooperative agreement by Associated Universities, Inc.